Dr. Kevin Butterfield will be leaving his role as director of the IACH later this summer to serve as executive director of George Washington's presidential library. Twelve University of Oklahoma undergraduates have been named IACH Fellows for the 2018-2019 school year. The 2017 Teach-In was all about constitutions. Revisit all of the day's lectures here, from the fragility of Germany's Weimar Republic to the rise of an authoritarian regime in modern Turkey. 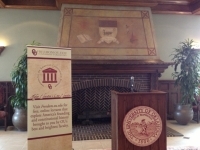 Freedom.ou.edu is a program of the Institute for the American Constitutional Heritage at the University of Oklahoma dedicated to promoting civic education through short, topical, online talks related to citizenship, freedom, and the Constitution. Become a lifelong learner on the web by watching the lectures and ongoing series. Are you interested in law, politics and history? Do you enjoy discussing and debating political and constitutional issues? Are you engaged with the world around you? 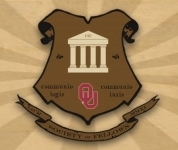 Learn more about the Society of Fellows, an honorary society to recognize and cultivate the best and brightest undergraduate students at OU.